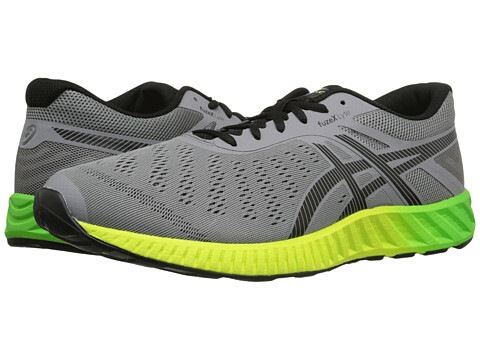 Cause a commotion when you show up to next weekend’s meetup ready to know out some miles in the ASICS® FuzeX™ Lyte running shoe!This brand is a member of the Sustainable Apparel Coalition.Predecessor: None.Support Type: Neutral to underpronator. Cushioning: Minimal feel with extreme flexibility. Surface: Road. Differential: 8 mm. Highly-breathable, lightweight mesh upper with thin synthetic film overlays. Seamless upper construction helps reduce the likelihood of irritation. Lace-up closure. Plush tongue and collar. Soft fabric lining offers a great in-shoe feel. Removable foam insole. fuzeGEL™ midsole features a fusion of GEL and foam to create lightweight, adaptable comfort that’s tuned to provide rearfoot shock absorption and forefoot bounce back. Heel/Toe: 19 mm/11 mmAHAR® rubber outsole delivers long-lasting durability in high-wear areas.Full-contact outsole design promotes smoother transitions from heel to toe. Imported.